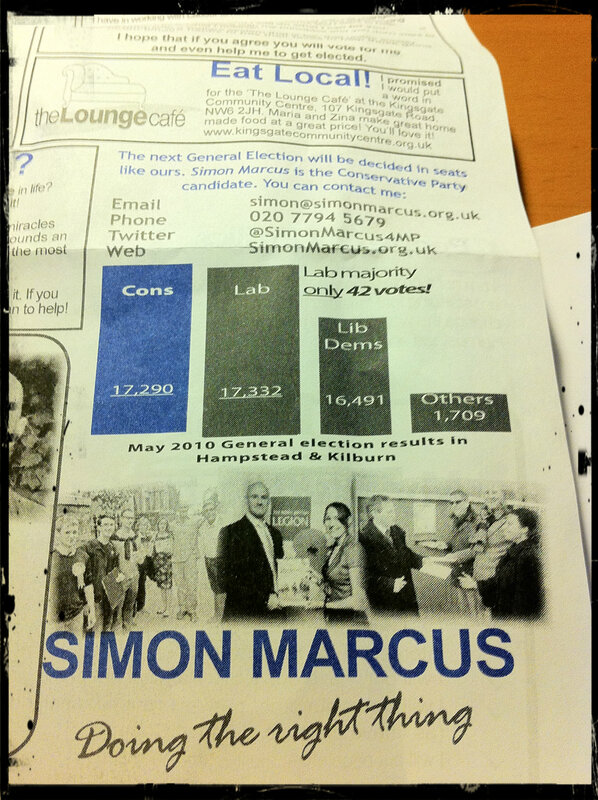 WITH Labour and the Liberal Democrats still working out who will stand in the Hampstead and Kilburn parliamentary constituency at the next General Election, you can’t blame Conservative candidate Simon Marcus for getting some plugs in for himself while he’s the only name on the slate. Now, the Tories must feel, is the chance to get the jump on whoever his opponents will be. So here come some of the first of the 2015 General Election leaflets for the people of Hampstead to digest… and like night follows day, it features a bar graph. And what a bar graph! A classic for connoisseurs of this kind of stuff. Despite losing the vote in Hampstead and Kilburn in 2010 by 42 votes, the blue bar still appears higher than the Labour one. Of course, a closer look shows that the Tory bar is not level with the Labour one at the base. The Lib Dems, who came a close third last, might also wonder what scale the graph is running to. It casts them as quite a big chunk behind. So, here we go, people, eyes down again. It looks like the old local theory is back in play: All’s fair in love and war, and election leaflets. Why do these people hate maths! Well that graph just looks silly and anyone reading it will probably think the same. Enlarging the gap between 2nd and 3rd is pretty common practice and to be expected, but trying to turn 2nd into 1st is plain daft. The Lib Dems’ share also a printing error? Let’s forget all the fun and games (and some of them quite dirty!) that go on at every election the big question is will Camden be releasing a similar statement to Green -led Brighton and Hove on the question of the bedroom tax???? If as Cllr Blackwell claims the stand Brighton and Hove are taking is purely cosmetic cosmetic and no different from the position already being adopted by Camden, then why is Camden Council so unwilling to release a similar statement?????? The truth of the matter is this council (Camden) is not really opposed to the bedroom tax at all, or else it would be doing more to be heard in its opposition to the policy. Forget the fun and games at election time (and this applies to all parties!) Camden voters aren’t going to be taken in this time round! Strange thread to post this – because the “no evictions” policy by Brighton (which isn’t in place, nor has it passed an equalities impact assessment) is just a slogan, as I have set out here: http://theoblackwell.blogspot.co.uk/2013/05/green-bedroom-tax-no-evictions-policy.html at length. Camden has made clear it’s views on the unfairness Bedroom Tax: having one of the largest council housing stocks around we are in the front line. What we won’t do is leave people down blind alleys following anonymous hard-left activist(s) who have always been more interested in sectarian campaigns against the Labour Party than a coalition against the Coalition! That is hilarious. Well done for exposing. Very much the same up and down the country. Certainly here in Colchester, the Lib Dems do it all the time – and in a much more exaggerated way. Hard left activists but many who don’t even belong to a political party! To some of us, the Labour Party lost it’s way some years ago, certainly in Camden when it was essentially taken to the High Court for attempting to throw old people out onto the scrap heap – remember, you lost the case! And even when you have been in power – the one party we might have relied upon (and certainly none of the others!) to really invest in social housing and fight to bring in rent controls, it just didn’t happen, because the real bread and butter issues so important to ordinary people out there were just not high enough on your agenda! Yes, go back to your predecessors who did a grand old job of working to build a nation fit for all! They certainly never just gave crumbs in exchange for votes – they believed ordinary people were worth far more. Were they ‘hard left activists’ or just fine Labour party members who lived by their principles and followed a committed vision on how to move the nation forward, but who never lost sight of the needs of the most vulnerable in this country! In essence, give us a Labour Party that’s worth our vote! I often wonder what those very fine predecessors would have done all those years ago if faced with today’s situation. One thing’s for sure, they would have been too proud to take the label of being a Labour Party member without doing their damndest to come out in true opposition to this government! As I’ve already said, give us a Labour Party worth our vote and there might just be chance ……………..
*met with Simon Marcus this morning #swisscottage. Labour beware and start working very hard ; and choose the right candidate – ‘locals’ stand no chance ! Doing the right thing. Somebody call Spike Lee. To be fair, I work with those two colour pinters every day, and it is REALLLLY hard to get the colours lined up exactly. You can move the drums in increments of 0.5cm, but if they’re misaligned by anything less (as I guess the case may be here) then you pretty much have to live with it. Although I’ve tried to change the way I design literature so that if the yellow and black become misaligned it isn’t immediately obvious. How fortuitous that the misalinging created the impression that you’re doing better than you are rather than the other way round.